This tool calculates the properties of a tee cross-section. Enter the shape dimensions h, b, tf and tw below. The calculated results will have the same units as your input. Please use consistent units for any input. 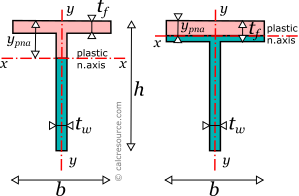 where h the tee height, b the width of the flange, tf the thickness of the flange (parallel to x-x) and tw the thickness of the web (perpendicular to x-x). where the Ix and Iy are the moments of inertia about axes x-x and y-y that are mutually perpendicular with z-z and meet at a common origin. The dimensions of moment of inertia are \([Length]^4 \). where the min designation is based on the assumption that \( y_c < h-y_c \), which is valid for any tee section. The dimensions of section modulus are \([Length]^3 \). 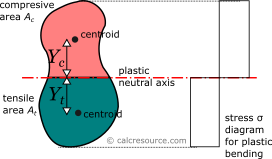 where Yc the distance of the centroid of the compressive area Ac from the plastic neutral axis and Yt the respective distance of the centroid of the tensile area At . where ypna the distance of the plastic neutral axis from the top edge of the flange. The first equation is valid when the plastic neutral axis passes through the web, while the second one when it passes through the flange. Generally, it can't be known which equation is relevant beforehand. Once the plastic neutral axis is determined, the calculation of the centroids of the compressive and tensile areas becomes straightforward. Expressions for these are not included here. where I the moment of inertia of the cross-section about the same axis and A its area. The dimensions of radius of gyration are \([Length]\). 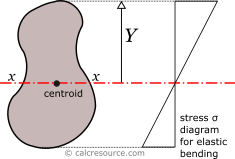 It describes how far from centroid the area is distributed. Small radius indicates a more compact cross-section. Circle is the shape with minimum radius of gyration, compared to any other section with the same area A.